How many total seats need cleaning? Is there any stain on your sofa/couch/upholster? How many cushions need cleaning? If you wanted to know how much your couch, upholstery or sofa cleaning may cost in Melbourne then we have the answer for you. Try our couch cleaning cost and quote estimator and get some idea in just a few seconds. Fill the form with best possible answers and you will get an estimate. Please note that it will reflect rough estimate only, the cost to do the job may be same or may change depending on the situation. If you have additional info to talk and discuss then just call us and we will be more than happy to answer that for you. 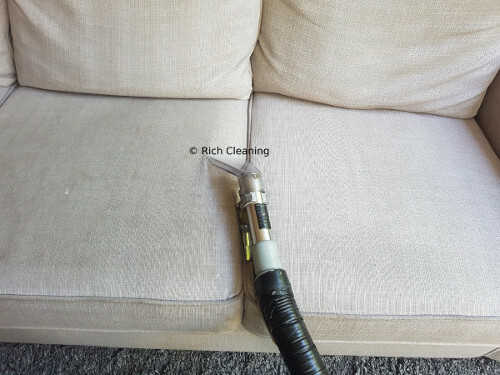 We provide best couch cleaning in Melbourne and if you are looking for a reliable cleaner in Melbourne to do quality job at a right price then talk to us today! How much couch and upholstery cleaning cost in Melbourne? The build quality of the sofa, example leather vs fabric. If any stain needs to be removed from the couch. If the couch may be way too dirty then it may require more time to treat that dirt. There are may couch cleaning companies in Melbourne who offer a cheap cleaning at a much lower rate but the result will be similar as well. If you are looking for the quality then maybe you need to pay little higher but you can get a better result at a right price. Technician with less experience may damage your couch so don't rich it, call a professional cleaner to do the quality job.